Buckwheat (Fig. 1, left), soybean, and cowpea planted in warm soil can cover the ground within two or three weeks. This “canopy closure” puts tiny, emerging weeds in the shade and hinders their growth. Summer or winter annual grasses like sorghum–sudangrass, various millets (Fig. 1, right), oats, rye, and wheat form dense, fibrous root systems that appropriate soil moisture and nutrients, leaving less for the weeds. Combining a grass with a legume or other broadleaf crop is often more effective than growing either alone (Fig. 2). Figure 1. This buckwheat (left), planted immediately after a vegetable harvest, has nearly covered the ground within 15 days after planting (DAP). Pearl millet (right) has formed substantial biomass by 42 DAP and effectively crowded out most weeds. Figure credits: Mark Schonbeck, Virginia Association for Biological Farming. Figure 2. A cover crop biculture of grass–legume can compete more effectively against weeds than either component alone. In this mature winter cover crop, the cereal rye has permeated the topsoil with a dense fibrous root system and provided support for the hairy vetch, allowing the latter to grow more vigorously and cast dense shade on the soil surface. Very little weed biomass was found in this cover crop, photographed here in late May on Cape Cod, MA. Figure credit: Mark Schonbeck, Virginia Association for Biological Farming. Fast-growing millets, forage soybeans, and sorghum–sudangrass can attain heights of four to seven feet, and aboveground dry biomass of four tons per acre within 65–70 days after planting (DAP). The grasses can mop up 100–150 lb N per acre in that time, and soybeans can fix up to 200 lb N per acre. Winter cereal grains, especially rye, can grow at temperatures just a few degrees above freezing, and thereby get a jump on early spring weeds. Oats and field peas planted in early spring can reach three to four feet and three tons per acre by the summer solstice. Watch this video clip for an excellent example of the use of sorghum–sudangrass ("sudex") to produce a high biomass, weed-suppressive cover crop (Grubinger, 2004). Clovers get off to a slow start and are not initially good competitors. However, clover seedlings, especially red clover, are quite shade-tolerant; thus clovers can be interplanted or overseeded into standing vegetable crops. When the vegetable is harvested and cleared off, the established clover seedlings grow rapidly, and taller varieties—such as mammoth red, crimson, berseem, and ladino clovers—can compete well against postharvest weeds. Competition from a strong cover crop can virtually shut down the growth of many annual weeds emerging from seed. Perennial weeds that emerge or regenerate from roots, rhizomes, or tubers are more difficult to suppress, but even their growth and reproduction can be substantially reduced by the most aggressive cover crops. As long as the cover crop is actively growing, intercepting light, and utilizing soil moisture and nutrients, later-emerging weeds have little opportunity to grow. Tilling the cover crop into the soil as a green manure terminates the competitive effect, leaving an open niche which should be occupied by planting a subsequent crop as soon as practical. All plants give off various substances that can affect the growth of other plants. Active compounds may be exuded by living plant roots, washed off the leaves and shoots into the soil by rainfall, or released from decaying residues. These allelochemicals, some of which are potent enough to be considered nature’s herbicides, have the greatest impact on germinating seeds, seedlings, and young plants, retarding their growth, causing visible damage to roots or shoots, or even killing them outright. Allelopathic effects strong enough to contribute significantly to weed control in field conditions have been documented for rye and other winter cereal grains, sorghum and sorghum–sudangrass hybrids, lablab bean, rapeseed, buckwheat, and subterranean clover (Putnam and Tang, 1986; Rice, 1995; Boydston and Hang, 1995). Cover crops in the brassica family, including rapeseed, mustards, and radishes, contain a number of compounds called glucosinolates, which break down into powerful volatile allelochemicals called isothiocyanates during residue decomposition, which can affect plant growth as well as micropbial activity. 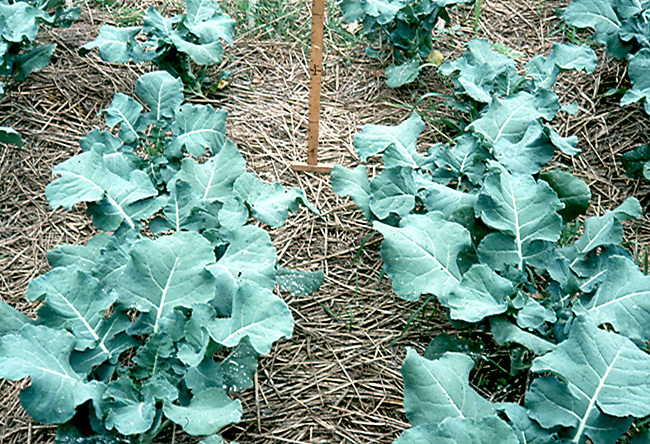 In field trials, some brassica cover crops have suppressed weed growth for several weeks or months after the cover crop was tilled in (Al-Katib et al., 1997; Boydston and Hang, 1995). However, it has been shown that weed suppression by radish cover crops is primarily a result of light exclusion that inhibits weed germination, not allelopathy (Lawley et al., 2012). Because each plant species gives off a unique combination of potentially allelopathic substances, and is itself sensitive to some allelochemicals and tolerant to others, allelopathic interactions are often species specific. 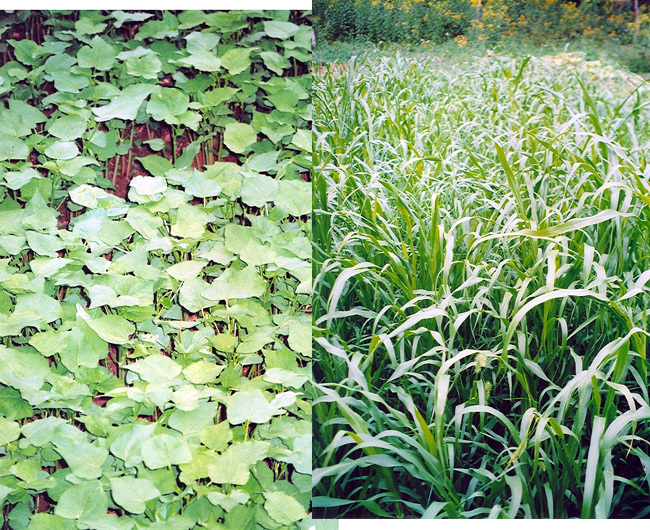 For example, winter rye and its residues are quite active against pigweeds, lambsquarters, purslane, and crabgrass, and far less so against ragweeds, sicklepod, and morning glories. Sunflower and subclover suppress morning glories, ande sorghum can inhibit purple nutsedge and Bermuda grass as well as many small-seeded annuals. Cover crop allelopathy can hurt some vegetables as well, particularly small seeded crops that are direct sown too soon after the cover crop. Lettuce seedlings are especially sensitive to allelochemicals, while large-seeded and transplanted vegetables are generally more tolerant. Tomatoes and other solanaceous vegetables thrive when transplanted through recently-killed residues of rye and/or hairy vetch (Smeda and Weller, 1996). Winter grain cover crop residues have been reported to reduce growth of cabbage, but to stimulate peas, beans, and cucumbers (Putnam and DeFrank, 1983; Putnam et al., 1983). Unlike direct competition, allelopathic weed suppression can persist for a few weeks after a cover crop is terminated. Tilling the top growth in as a green manure causes an intense but relatively brief burst of allelopathic activity throughout the till depth. Leaving the residues on the surface as an in situ mulch creates a shallow (less than one inch) but more persistent allelopathic zone that can last for three to ten weeks depending on weather conditions. Thus no-till cover crop management offers a potential for selective suppression of small-seeded annual weeds in transplanted and large-seeded vegetables, whose roots grow mostly below the allelopathic zone. In addition to this "selectivity by position," some allelochemicals may be inherently selective toward larger seeds. In petri dish germination tests, green pea seeds (large) were far more tolerant to low (1–5 ppm) concentrations of various isothiocyanates than redroot pigweed seeds (small), with barnyard grass seeds (medium) showing intermediate sensitivity (Al-Khatib et al., 1997). Similar selectivity has been observed in field studies, on vegetables grown after brassica cover crops. 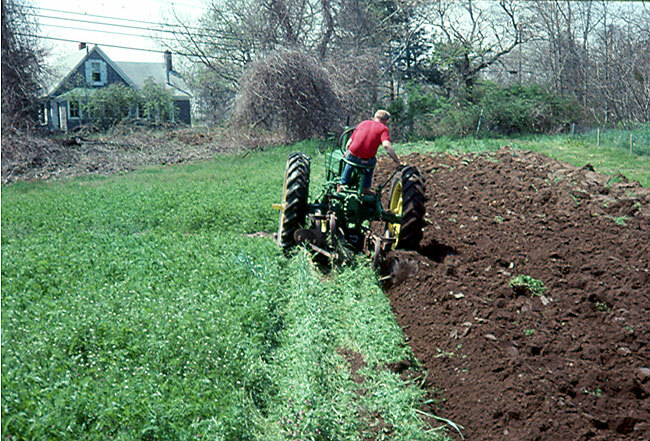 Whereas the weed suppressive effects of the cover crops persisted for at least part of the vegetable growing season, yields were either unaffected or improved in potatoes (Boydston and Hang, 1995), peas, spinach (direct-sown), onions (from sets), and transplanted lettuce (Al-Khatib et al., 1997; Schonbeck, 2007). While a brief flash of unfiltered daylight, or even a few minutes of full moonlight, can trigger germination of many small-seeded weeds, the green light that reaches the soil beneath a closed canopy of plant foliage tends to inhibit germination (Fig. 4). This is because many seeds sense the quality of light by means of a special compound called phytochrome that works as a molecular switch. Red light (abundant in daylight) flips the switch to “germinate now” whereas light that is poor in red and rich in far-red (a wavelength between red and infrared, barely visible to the human eye) flips the switch to “go dormant”. The chlorophyll in green leaves absorbs most of the red light and transmits the far-red, and the phytochrome in weed seeds senses the filtered light as a signal that a shading canopy is present, rendering conditions unfavorable to weed growth. Many early spring annual weeds initiate germination in fall, and the startling spring weed suppression after a daikon radish crop (Fig. 3) is primarily a result of changes to the light quality created by a completely closed radish canopy. This makes early cover crop seeding and complete canopy closure essential for optimizing weed suppression by forage radish (Lawley et al. 2012). For more information on daikon and forage radishes, see the eOrganic article on Radishes-A New Cover Crop for Organic Systems. 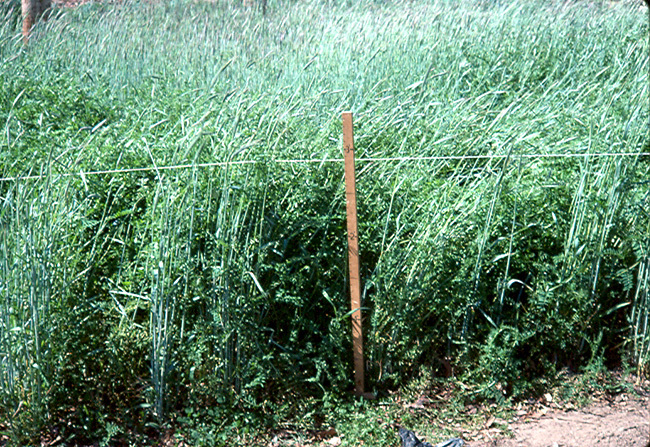 Part of the weed-suppressive effects of hairy vetch cover crops have also been attributed to this light quality effect (Teasdale and Daughtry, 1993), and this phenomenon may also contribute to the weed suppression sometimes observed after other dense-canopy cover crops like buckwheat (Fig. 1). Figure 3. A daikon radish cover crop, sown in August, covered the ground with a heavy canopy by midautumn (left). 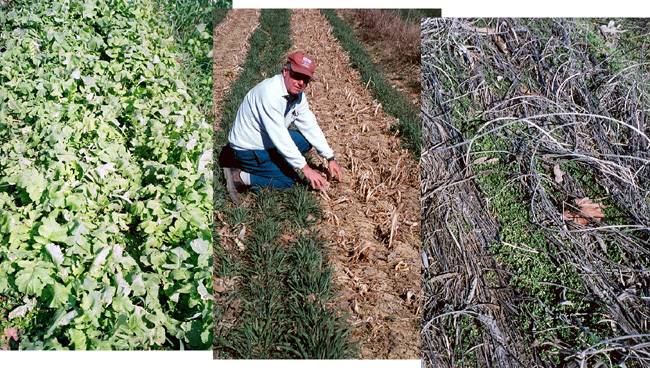 The crop winter-killed and its residues mostly disappeared by March, yet Professor Ron Morse of Virginia Tech could find almost no winter weeds in the radish plots (center), whereas common chickweed grew vigorously through the more persistent residues of other winter-killed cover crops (right). Early spring chickweed and many other annual weeds initiate germination in fall. By intercepting light, the fall radish canopy prevents weed seed germination. Figure credits: Mark Schonbeck, Virginia Association for Biological Farming. Figure 4. This year-old stand of red clover casts dense shade and alters the quality of light reaching the ground so that seeds of most annual weeds are no longer stimulated to germinate. Several field studies have documented a decline in annual weed populations in cultivated fields that are rotated to red clover for one or more years. With few or no annual weeds growing and replenishing the weed seed bank, weed seed numbers decline through seed predation, physiological aging, and decay. Figure credit: Mark Schonbeck, Virginia Association for Biological Farming. Each plant species exudes through its roots a characteristic mix of substances, including carbohydrates, amino acids, organic acids, and other “microbial food”, as well as its particular set of allelochemicals. This biochemical mix elicits and supports a specific microflora (community of fungi, bacteria, protozoa, and other microorganisms) in the plant’s rhizosphere (the soil immediately adjacent to the plant roots); to a lesser degree, it also influences the microflora of the bulk soil. The microbes fostered by one plant species can help, hinder, or even sicken another plant species. A vigorous cover crop with an extensive root system that harbors microorganisms harmful to certain weeds can thereby provide an added measure of control of those weeds. For example, most grain and legume cover crops are strong hosts for mycorrhizal fungi which live as root symbionts and enhance crop growth. Several major weeds, including pigweeds, lambsquarters, nutsedges, purslane, and weeds in the buckwheat family, are nonhosts that do not benefit from mycorrhizae, and may exhibit reduced vigor if their roots are invaded by mycorrhizal fungi (Francis and Read, 1995; Muthukumar et al., 1997). Several researchers have begun to explore the potential of mycorrhizal fungi as a weed management tool (Jordan et al., 2000; Vatovec et al., 2005). Plant root exudates and plant-microbe interactions can also influence certain species or classes of microorganisms in the soil as a whole, with subsequent effects on other plants. For example, the glucosinolates and isothiocyanates released by crops and weeds in the crucifer family (such as brassica crops, wild mustards, and yellow rocket) can inhibit soil fungi, including some pathogens (Haramoto and Gallandt, 2004). Crucifers and other nonmycorrhizal host plants, while not directly toxic to mycorrhizae, do not support the high populations of active mycorrhizal fungi often found in the soil after strong-host species such as most legumes. Crop–weed–soil–microbe interactions are one of the cutting edges in organic weed management research. Scientists are searching for specific microbial species or floras that thrive in the root zone of widely-used cover crops, and that attack or suppress major weed species without posing a serious threat to the desired vegetable crops. These relationships are complex, and practical applications are some years or decades away. When a cover crop is killed by temperature extremes, mowing, or rolling, residues left on the soil surface as a mulch can continue to hinder weed growth for some time. By keeping the soil surface shaded and cool, and by reducing daily fluctuations in soil temperature, the organic mulch reduces the number of weed seeds that are triggered to germinate. Small-seeded broadleaf weeds that do sprout are often effectively blocked by a 2–3 inch thick layer of cover crop residues. Larger-seeded broadleaf seedlings, grass seedlings, and perennial weed shoots from buried rhizomes and tubers will eventually get through, though even their growth may be delayed by residues of a high biomass cover crop. The mulch effect can be enhanced by the release of allelopathic substances from the decaying residues, as noted earlier. In addition, organic mulch provides habitat for ground beetles and other predators of weed seeds, as well as microorganisms that can attack and kill weed seedlings. Weed suppression by cover crop residue can vary from negligible to highly effective for anywhere from two weeks to several months (Fig. 5), depending on cover crop biomass and nitrogen (N) content, season, weather, and soil conditions. Warm, moist weather combined with high soil biological activity accelerates decomposition of cover crop residues and their allelochemicals, thus shortening the weed control period. Strawy, low-N residues last longer than succulent, high-N residues. In dry climates, the weed suppressive effect of even a legume cover crop mulch can be substantial (Hutchinson and McGiffen, 2000). Figure 5. This rye–vetch cover crop mulch delayed weed growth sufficiently to prevent significant weed competition against the broccoli. The mulch effect effectively blocked most annual weeds, while a few perennial quack grass are beginning to break through. The cover crop was mowed and the broccoli transplanted about seven weeks before this picture was taken on Cape Cod, MA. Figure credit: Mark Schonbeck, Virginia Association for Biological Farming. Tilling a cover crop into the soil as a green manure stimulates a flush of microbial activity that can make the soil temporarily inhospitable to most weeds and crops. The tillage itself stimulates weed seed germination, but the incorporated residues may promote damping-off fungi and other pathogens that then attack the weed seedlings (Kumar et al., 2008). If the residues are rich in carbon (C) relative to N (C:N ratios of 30 or higher), soil microbes will immobilize (tie up) plant-available soil N while consuming the C-rich organic matter, and thereby slow the growth of weed seedlings. These effects—combined with the brief intense flush of allelochemicals from certain cover crops, especially radish and other brassicas—can help clean up a weedy field. On the other hand, leguminous or young, succulent green manures (Fig. 6) provide plenty of N and other nutrients that can stimulate a burst of weed emergence and growth, thereby negating earlier weed-suppressive effects of the cover crop. Figure 6. A farmer on Cape Cod, MA plows down a winter cover crop of hairy vetch in late spring. The succulent, high-nitrogen legume cover crop will decompose rapidly and require only a short (one to two week) waiting period before vegetables can be planted. The disadvantage to this practice is that it may also open a highly fertile niche for weed growth. Figure credit: Mark Schonbeck, Virginia Association for Biological Farming. Note that cash crops are also subject to green manure effects. Vegetables should not be planted during the microbial flush after soil incorporation of a green manure. Careful timing is essential to avoid adverse effects of green manure on vegetables, yet take advantage of temporary weed-suppressive effects that can give the vegetable a head start on the weeds. Al-Khatib, K., C. Libbye, and R. Boydston. 1997. Weed suppression with Brassica green manure crops in green pea. Weed Science 45: 439–445. (Available online at: http://www.jstor.org/stable/4046046) (verified 23 March 2010). Boydston, R. A., and A. Hang. 1995. 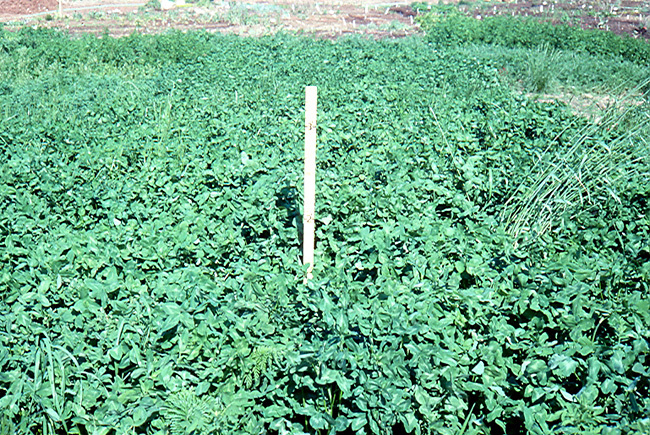 Rapeseed (Brassica napus) green manure suppresses weeds in potato (Solanum tuberosum). Weed Technology 9: 669–675. (Available online at: http://www.jstor.org/stable/3988342) (verified 23 March 2010). Gruver, J., R.R. Weil, C. White, Y. Lawley. Radishes-A New Cover Crop for Organic Farming Systems [Online]. eOrganic article. Available at http://www.extension.org/pages/64400. Hutchinson, C. M., and M. E. McGiffen, Jr. 2000. Cowpea cover crop mulch for weed control in desert pepper production. HortScience 35: 196–198. Muthukumar, T., K. Udaiyan, A. Karthikeyan, and S. Manian. 1997. Influence of native endomycorrhizae, soil flooding and nurse plant on mycorrhizal status and growth of purple nutsedge (Cyperus rotundus L.). Agriculture, Ecosystems and Environment 61: 51–58. (Available online at: http://dx.doi.org/10.1016/S0167-8809(96)01073-0) (verified 23 March 2010). Putnam, A. R., and J. DeFrank. 1983. Use of phytotoxic plant residues for selective weed control. Crop Protection 2: 173–181. (Available online at: http://dx.doi.org/10.1016/0261-2194(83)90042-X) (verified 23 March 2010). Putnam, A. R., J. DeFrank, and J. P. Barnes. 1983. Exploitation of allelopathy for weed control in annual and perennial cropping systems. Journal of Chemical Ecology 9: 1001–1010. (Available online at: http://dx.doi.org/10.1007/BF00982207) (verified 23 March 2010). Putnam, A. R., and C-S. Tang (ed.) 1986. The science of allelopathy. John Wiley & Sons, New York, NY. Smeda, R. J., and S. C. Weller. 1996. Potential of rye (Secale cereale) for weed management in transplant tomatoes (Lycopersicon esculentum). Weed Science 44: 596–602. (Available online at: http://www.jstor.org/stable/4045642) (verified 23 March 2010). Teasdale, J. R., and C.S.T. Daughtry. 1993. Weed suppression by live and desiccated hairy vetch (Vicia villosa). Weed Science 41: 207–212. (Available online at: http://www.jstor.org/stable/4045306) (verified 23 March 2010). Vatovec, C., N. Jordan, and S. Huerd. 2005. Responsiveness of certain agronomic weed species to arbuscular mycorrhizal fungi. Renewable Agriculture and Food systems 20: 181–189. (Available online at: http://dx.doi.org/10.1079/RAF2005115) (verified 23 March 2010).